I received a copy of The Never List by Koethi Zan from the publisher in exchange for an honest review. I also had the pleasure of meeting Koethi Zan at a book signing several weeks ago at Politics & Prose, an independent bookstore in DC. The event was wonderful, and it was fascinating to learn more about the author’s vision, which drew inspiration from a number of real life cases. 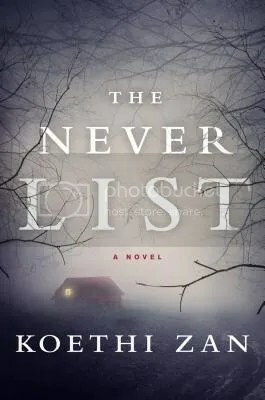 The Never List is the story of two friends, Sarah and Jennifer, were kidnapped as college students and held hostage in a sadistic man’s basement. Sarah was rescued, but it was too late for Jennifer. Ten years later, their kidnapper is up for parole, and Sarah engages on a mission to come to terms with the past and to find Jennifer’s body, keeping Jack behind bars. I was intrigued by the author’s treatment of the abuse that the girls suffered. The experiences of the kidnapped girls was usually alluded to rather than explicitly detailed. There is some bare bones description of events central to the plot, but the bulk of the horrors that they faces is left up to the readers’ imaginations. This allows the focus to remain on Sarah’s healing and her mission to discover Jack’s secrets. One dynamic that was explored in great depth was the relationships between the kidnapped victims. Even though they spent years in a room together, they parted ways and didn’t speak to each other after their rescue. Part of Jack’s manipulation involved psychologically controlling them and pitting them against each other. In the end, only the chance that Jack might be released was a strong enough motivation to allow them to reconnect and learn to trust each other. While the subject matter is violent and traumatic, the story is ultimately a tale of empowerment and healing. Sarah stops functioning as a victim and instead takes the role of the detective. She finally has a chance to fight back and to regain control of her life. The Never List is much darker than what I usually read. Generally, I don’t read depressing fiction, because real life is depressing enough. This book in particular calls to mind the Cleveland kidnappings that have been in the news so much recently. Indeed, at the book signing, the author mentioned that her story was inspired by the many recorded real life kidnapping cases. As dark as the book was, I read it in one sitting. The Never List is gripping, suspenseful, and even though it addresses the evil in the world, it provides a message of hope and of the resilience of the human spirit. I’d highly recommend it. And now, for the giveaway. The giveaway is limited to U.S. addresses (P.O. boxes don’t count) and ends on 8/29. To enter, go to the Rafflecopter Linky on my blog’s Facebook page. 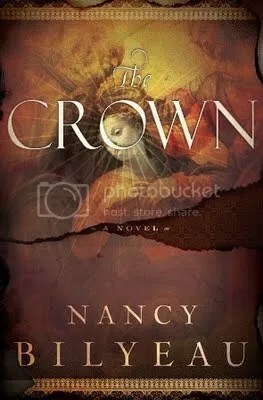 I received a copy of Nancy Bilyeau’s “The Crown” as part of the TLC Book Tour for its sequel, “The Chalice.” My post for “The Chalice” is scheduled for mid-August, but I wanted to read and review “The Crown” first to become familiar with the characters and story. “The Crown” is a historical thriller set in Tudor England. The protagonist, a young Dominican novice named Joanna Stafford, sneaks away from her convent to attend her cousin’s execution. Her trip doesn’t go quite as planned, and she and her father are captured and sent to the Tower of London. The Bishop of Winchester releases Joanna, but on one condition–she is to be his spy, and to locate the whereabouts of the Athelstan Crown, which he believes to be hidden in her convent. Her father is still held in the Tower, and will not be released unless Joanna is successful in her mission. Can she betray the sisters and the convent that she calls home? When I was a teenager, I used to be obsessed with historical fiction set in the Tudor era, and read everything that I could get my hands on. This book is a throwback to that time of my life, and it was highly enjoyable. It’s a different point of view than most of what I’ve read, as the bulk of the action and intrigue takes place away from Henry VIII’s court. There’s also an element of mystery and treasure hunting. It’s what would happen if you mix Phillipa Gregory with Dan Brown. I loved that the main character is a nun. Nancy Bilyeau explores the dynamic between the different sisters and the community that they form. It’s an unusual setting for Tudor fiction, and it’s absolutely perfect. Joanna feels at peace at Dartford, and likes it far better than she had serving at Queen Mary’s court. The fact that she has experienced both shapes her character. Joanna is level-headed and determined, and completely aware of the way that the world works. At the same time, she’s very human. We see her struggle with her conscience and with her faith, especially when she learns about some of the abuses that are going on within the Catholic Church–for example, many of the convents and monasteries have been faking relics in order to generate income from unwitting pilgrims, and the Bishop of Winchester, who should be an upstanding leader, is torturing her father to force her obedience. It’s an interesting perspective, especially against the backdrop of the Reformation. Despite the fact that Joanna is a novice at a convent, the book plants the seeds for a love triangle in the sequel. I’m curious to see how it will go, as right now it’s kind of in the background, and for most of the book Joanna doesn’t entertain any notion of ever having a romantic relationship. I’m generally not a fan of love triangles, but I’m hoping that it will be tastefully done and that Joanna will choose the path that’s right for her. “The Crown” had me sitting on the edge of my seat dying to know what would happen next. It is a fast-paced tale of murder and intrigue set against the turmoil of the Reformation, and I look forward to reading the sequel. Brandon Sanderson is one of my favorite authors of all time, and so when a Kindle version of his novella “Legion” was released, I purchased it immediately. It’s not the next “Stormlight Archive” book by any stretch of the imagination, but it did help to tide me over until it comes out. The opening lines immediately drew me into the story. My name is Stephen Leeds, and I am perfectly sane. My hallucinations, however, are all quite mad. Unlike most of the books that I read, “Legion” is set in today’s world. It’s the story of a man who hallucinates, and his hallucinations help him to solve crimes. When a woman named Monica asks for his assistance in tracking down a man who invented a camera that can take snapshots of the past, Stephen is intrigued. The case raises many theoretical and philosophical possibilities, including what the world would be like if there was proof of the veracity of any modern religion. Even though the book is relatively short, it challenges readers to think about the world today and to question prejudices and assumptions. For instance, the main character talks to characters that he hallucinates, but at the same time, he is able to lead a functional life and to support himself. He considers himself to be more sane than people with dysfunctional careers/marriages/etc., even though is brain functions differently than the norm. Stephen’s hallucinations (called aspects) were quirky, to say the least. They range from J.C., a crazy right-wing gun nut, to Ivy, a therapist who treats other aspects’ own mental illnesses. When they travel to Jerusalem, Stephen hallucinates an interpreter to guide them, and as such is able to communicate. It’s brilliant. While I loved the story and the concept, I wanted a bit more from “Legion.” It was the tale of one specific case that Stephen and his aspects take on, and it felt as if it were merely an episode of a larger story. I don’t want to see that story left untold. For example, there was a woman in Stephen’s past who taught him to use his powers and then disappeared. What happened to her? Who was she? Will he find her? The ending of the story left me with more questions than answers. 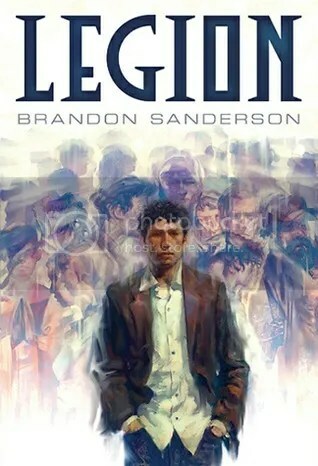 Sanderson’s website says that “Legion” was a story that he wrote while on a plane to France. He stated that because he was working on other projects, he didn’t have the time to expand it into anything larger. I wish that he had. It’s a good story, and I would still recommend reading it (the e-book edition is only $2.99, which is worth it for a quick read). At the same time, it had so much unfulfilled potential, and I expected better. Avast, ye landlubbers! 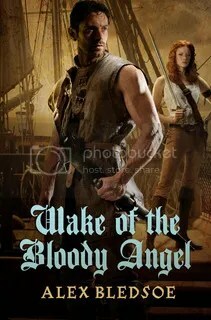 In case you didn’t get enough pirate fun yesterday during International Talk Like a Pirate Day, today is my stop on the blog tour of Alex Bledsoe’s “The Wake of the Bloody Angel.” The tour is hosted by TLC Book Tours, and I received a copy of the book in exchange for an honest review… you know the drill. I’m also counting it toward the R.eaders I.mbibing P.eril VII event, as this book has such delightful ghosts and sea monsters. “The Wake of the Bloody Angel” is technically the fourth book in the Eddie LaCrosse series, but the books are self-contained mysteries, so it isn’t important to have read the earlier stories to understand this one. I haven’t read any of them and still enjoyed this segment; there were a couple allusions to earlier events, but nothing major. This book makes me want to jump back in and read some of the earlier books, because the idea of a detective novel set in a fantasy world is awesome and allows for a lot of intriguing possibilities. Eddie LaCrosse is a sword jockey; he’s basically a cross between a mercenary and a private investigator. One of his close friends, the lovely barmaid Angelina, hires him to track down her former love interest, a reputable pirate named Black Edward Tew. Of course, Angelina hasn’t heard from him in more than twenty years, and his disappearance and treasure have already become engrained in pirate lore. Enlisting the aid of a pirate-queen-turned-pirate-hunter named Jane, Eddie sets sail to pick up an impossibly cold trail. It will take all of his considerable skills to solve this one! I enjoyed the fact that Eddie has a conscience. Part of the reason why he’s a mercenary is so that he can set his own rules and not do anything terribly unethical. Basically, he only kills the bad guys, making him the type of hero that you can root for. Sometimes I do enjoy antiheroes, but in this case, Eddie’s moral compass is a major theme throughout the story, and he’s unequivocally the good guy. Jane was easily my favorite character. She’s the kind of kickass heroine that I wish showed up in more books; she’s competent, self-possessed, and ruthless. One of the things that I found interesting about the book is that it features a middle-aged protagonist. Eddie LaCrosse is in his forties, and he’s quite clearly not as young and spry as used to be. It’s a mature sort of adventure, and that’s a good thing. As many of the characters were older, there was a recurring idea of figuring out what you want from life and what makes you happy, regardless of societal pressure to do things differently. Both Eddie and Jane’s love lives reflected this. Neither of their relationships are truly conventional, but they suit the characters well. I’d definitely recommend this one if you’re looking for a swashbucklingly good read. If you’re interested in trying it out for yourself, the publishers at TOR are letting me give away a copy. The giveaway is limited to folks in the US and Canada. Just leave a comment to enter, and I’ll pull names out of a hat on Thursday, September 27, which is a week from today.